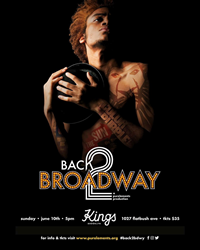 Purelements, an Evolution in Dance to host their 11th annual Spring concert, Back 2 Broadway, a musical of flying dreams and reimagined works from popular Black Broadway shows on Sunday, June 10th at Brooklyn’s historic Kings Theatre. “Back 2 Broadway" shares the experience of one young man’s journey, as he strives to live out his dreams of becoming a celebrated Broadway star. In this sequel to their 2017 performance, "Broadway Our Way," the protagonist must overcome his doubts and fears as he travels to Brooklyn’s historic Kings Theatre to compete in a talent show for the coveted winning prize: A chance to sign a deal with one of the best agencies in the business. The full scripted musical, written and directed by Purelements Co-Artistic Director, Lakai Worrell, is a mashup of modern, West African, tap, jazz and hip-hop dance and songs performed by Purelements’ Center of Artistic Refinement (COAR) program. Plus, special performances by guest actor, dancer, singer, Lamar K. Cheston and actresses Ramona Dunlap and Jaleesa Capri. New choreographed pieces integrated into the production are an ode to popular Broadway shows critical to Black American history, like “The Wiz;” “Motown;” “Dreamgirls;” “FELA!” and more choreographed and developed by the COAR program’s teaching artists. COAR’s 2018 teaching artists include: Tricia Greenidge; Keisha Washington; Halima Lawrence (ballet); Eddie Stockton (modern/jazz); Hollie Wright (ballet/tap); Men Ca (modern); Dorian Rhea (tap); Chio Bakr (hip-hop); Whilhemenia Taylor (West African). As Broadway shows are often revered as the quintessential portrayal of success for actors, dancers and musicians, the theme in this sequel production speaks to Purelements’ initiative to expose the rich legacy of Black Broadway to children of color. Despite limited and often marginalized opportunities for playwrights, directors and performers of color on Broadway, Purelements works to establish a connection for its students that is deeply rooted in appreciation and respect for those who’ve opened doors to create an opportunity in an industry that was once not an option for them. Students performing range from ages 3-21 and vary in experience from novice to pre-professional. All of the COAR students have trained in 2-5 dance genres in preparation for the Spring concert performance for 9 months. “Back 2 Broadway" will be held on Sunday, June 10, 2018 at the Kings Theatre, located at 1027 Flatbush Avenue Brooklyn, NY 11226. Doors open at 4pm and the performance starts at 5pm. General admission is $35 and tickets are available at Ticketmaster.com. Funding for this program is provided by the Department of Cultural Affairs, the office of Council Member Inez Barron and the office of Assembly Member Latrice Walker. To connect with Purelements, join the Purelements Facebook community, follow @Purelements on Twitter and on Instagram and on YouTube @Purelements. Follow the conversation online at #Back2Bdway. For downloadable images and other Broadway Our Way press assets, visit http://bit.ly/PurelementsB2BwayDB. Purelements: an Evolution in Dance ("PE") is a 501(c) 3 performing arts organization founded in 2006, by Kevin A. Joseph and Lakai Worrell. The mission of PE is to use multiple facets of the performing arts as educational tools to evolve and transform the individuals and communities it serves, and to present dynamic performances that are socially relevant and impactful. PE's mission unfolds through an art-in-education program, a performing arts program and its professional and pre-professional dance companies. The Center of Artistic Refinement (COAR) school is an enriching youth and pre-professional training program designed to inspire young artists to explore future studies and careers in the performing arts as dancers, singers, musicians or more. Through the study of various dance disciplines, including Classical Ballet, Modern, Traditional West African, Hip Hop, Musical Theater, Jazz and Choreography, students experience a growth, not only in technical proficiency, but character development as well. The COAR program is vital to the organization's mission, which is to use multiple facets of the performing arts as educational tools to evolve and transform the individuals and communities we serve. To learn more about Purelements, visit purelements.org.